Fortunately, however, for the eleven hardy birders who headed out to census our wintering birds on this Sunday’s (Dec 16) CBC, the weather gods, if not exactly benevolent, did at least leave us with a dry, but sunless day. Good birders in the field, a dry day, and a little bit of luck can mean a good count. And we had all three on Sunday. 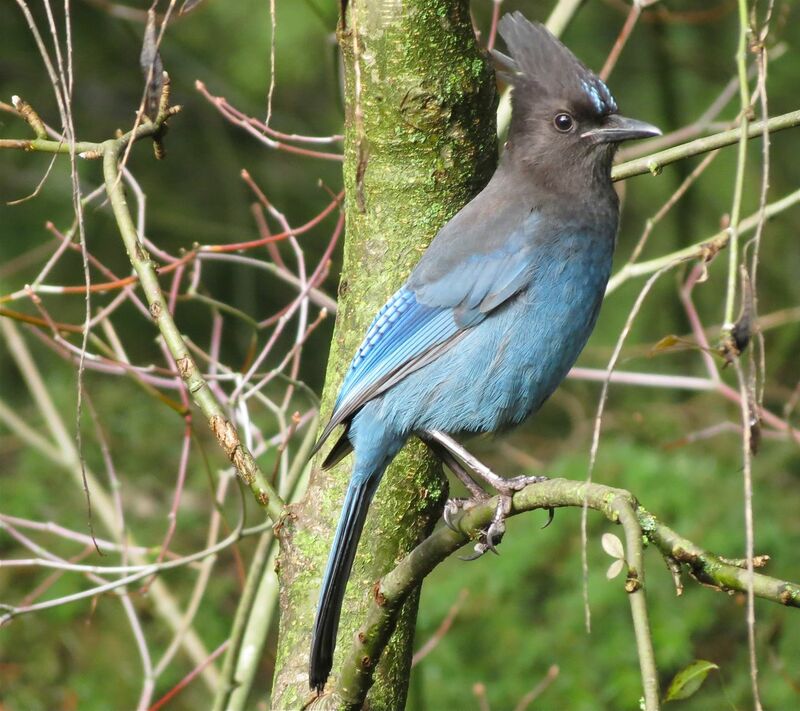 Even before it was fully light at 8:00 a.m., noisy Steller’s Jays (above) were one of the day’s first additions to field notebook. Birds that announce their presence make for quick and easy birding – many of the birds on the census are identified and counted “by ear” through their calls and other vocalizations . 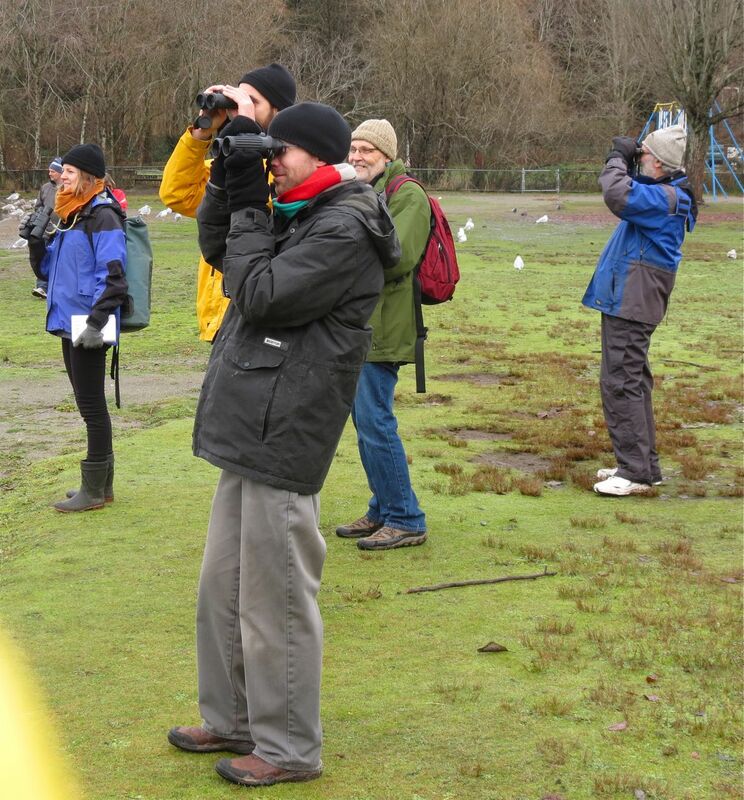 Although a number of vocal landbirds were identified early at the shores of Burnaby and Deer Lakes, where the two teams each began their days’ birding, the first order of business was to count the waterbirds. 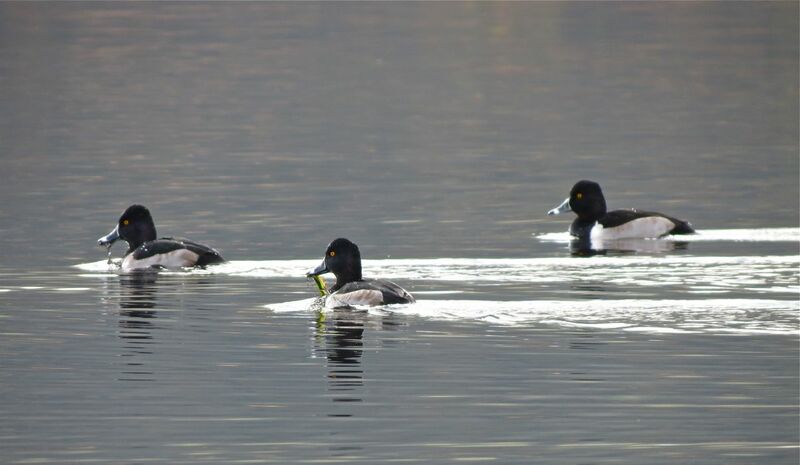 With two unfrozen lakes on which to count ducks and other aquatic birds, we usually do quite well in this aspect of our CBC bird list. 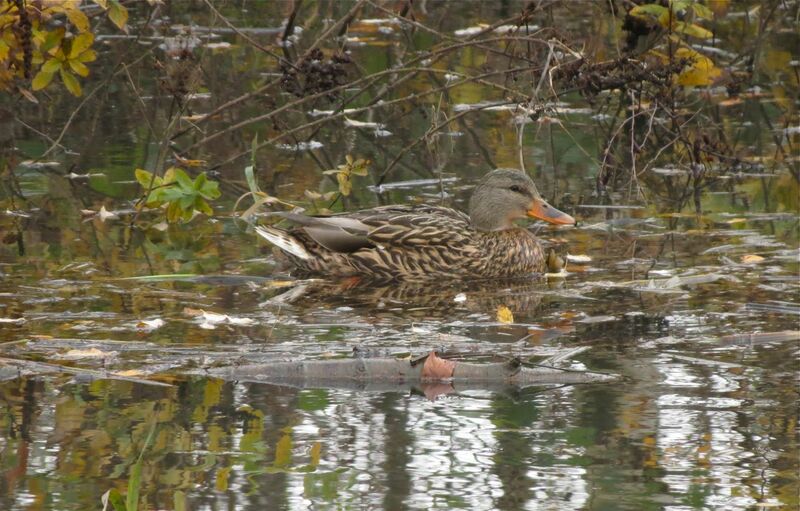 Our most numerous duck species (223) were, not surprisingly, Mallards. 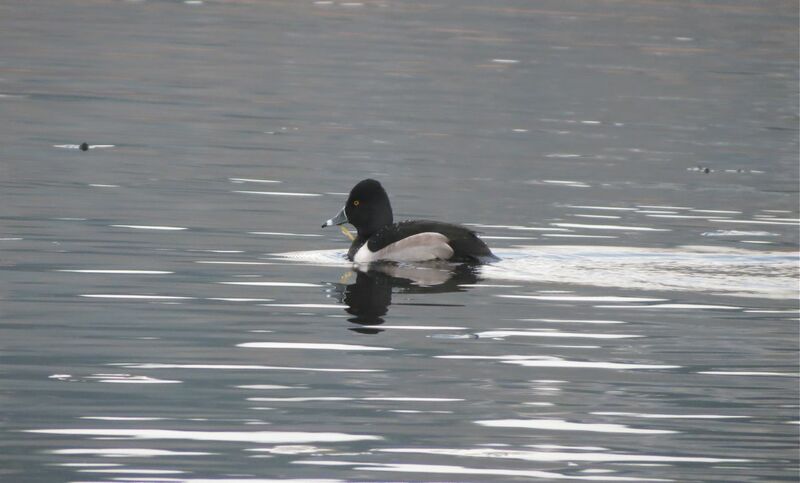 A far less common duck (19 counted), and until 2005 one that we didn’t see on the count at all, is the very nattily plumaged Ring-necked Duck. The local increase in winter numbers of this duck is a reflection of a general continent-wide increase in this species. 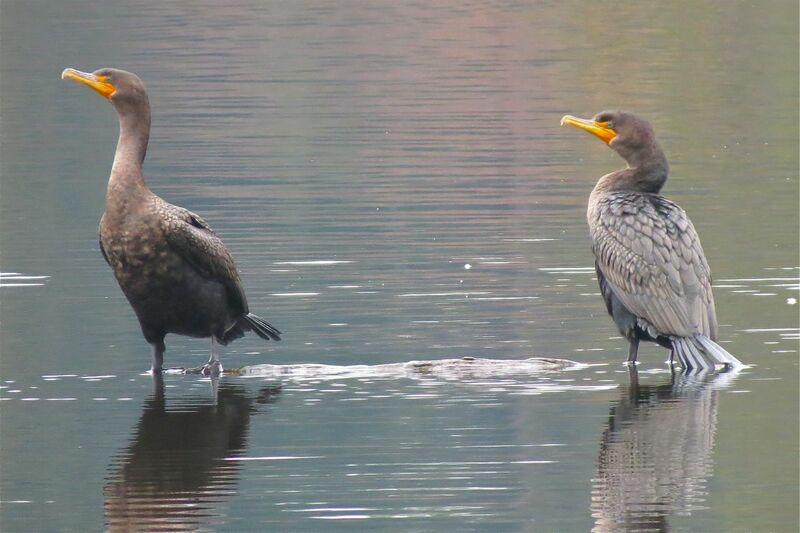 Other waterbirds we recorded on Sunday included the somewhat ancient-looking, fish-eating Double-crested Cormorant (15). Many consider this one of our less attractive birds, and although superficially drab, their turquoise eyes are a surprise feature that is only seen when the light is just right. These two are brownish immatures; the adults are glossy black. Remember to click on the images for a closer look. And we don’t necessarily have to look on the water for all waterbirds. Many spend as much time on land as in the water. 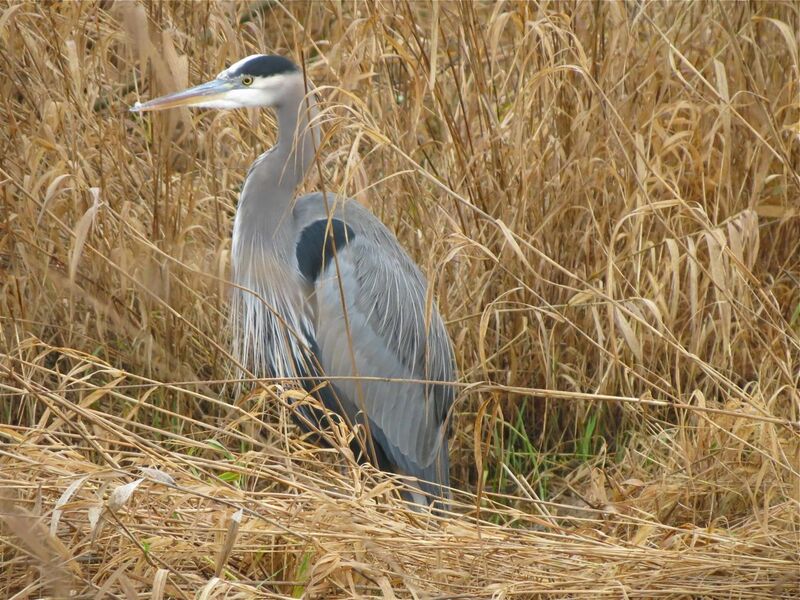 Great Blue Herons (4) not only wade the lakeshores, but also hunt in the long grass meadows at Deer Lake. The one below is demonstrating its hunting techniques – likely looking for the voles that inhabit the meadows at the western end of Deer Lake Park. We counted this one near the outflow of Beaver Creek into the west end of the lake. 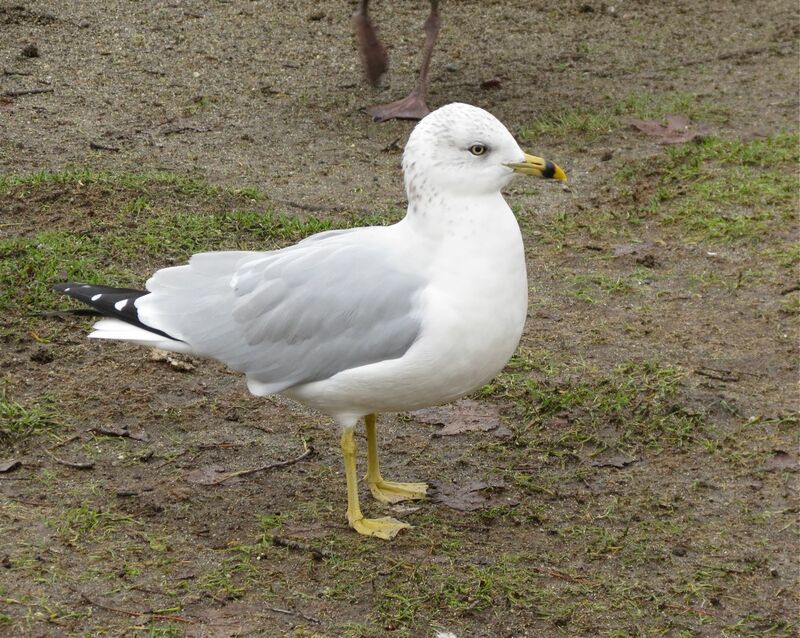 Talking of waterbirds on land, our biggest numbers of gulls on the count are usually found at the east end of Deer Lake, where they hang around in the playground area waiting for handouts. This year was no exception, but while numbers were reasonable, the species count was modest; just two, plus a few hybrids. Ring-billed Gulls (30) are the daintier of the two species, and this one is showing its diagnostic yellow legs, yellow iris, black wing tips, and the banded bill that gives it its name. 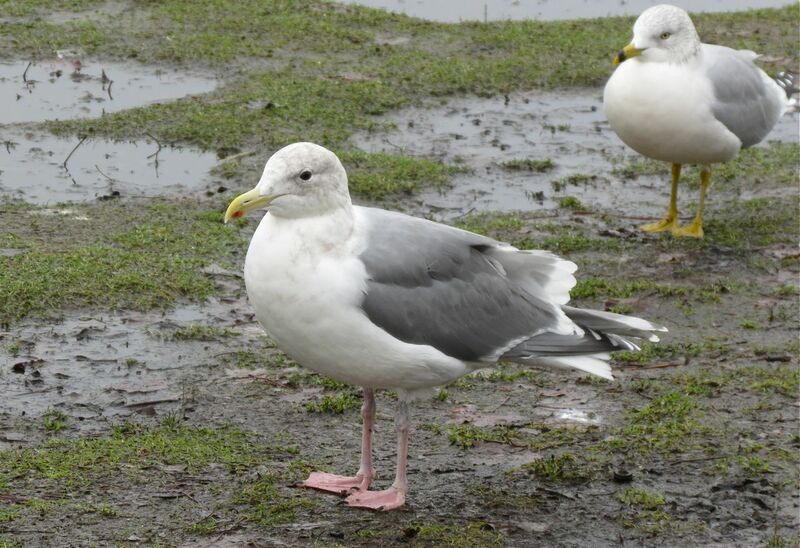 The dirty-looking head feathers on this bird are found on most adult gulls in winter. Over the course of the season, the brownish feather tips wear off leaving the heads bright, clean, and white ready for the spring and for the breeding season. The other gull we counted on Sunday is the Glaucous-winged (46), our commonest species locally. It too has the “dirty” head effect, but is a much bulkier, heavier-billed bird than the Ring-billed. Compare the picture of the two birds to see the differences between the two. For the Glaucous-winged, note the large yellow bill with the red spot on the lower mandible, pink legs, dark iris, and grey wingtips the same colour as the back (mantle) feathers. Also, in the picture above note the size difference compared to the smaller Ring-billed behind. Gulls can be very challenging to correctly identify, but separating the Cackling Goose from the very familiar Canada Goose can at times be even more of a challenge. In fact, up until 2004 the Cackler was considered just a small type of Canada Goose. However, it is smaller, darker coloured, breeds further north and west in the Arctic and sub-Arctic than the Canada Goose, and has a high yelping voice that is clearly different from the Canada Goose’s honking. These characteristics, along with genetic studies, confirmed it as a different species. Look for the short neck and small bill as field marks. If you scratch your head over whether you’re looking at a Canada or a Cackling, don’t despair. It’s a subtle identification. Below is part of the flock of 130 cacklers we counted on the rugby fields at Burnaby Lake. A real surprise for us, and a first for the count this year, was that Cackling Goose numbers were higher than Canada Goose numbers. The Canada’s must have been feeding elsewhere on Sunday. OK, so how did we tie last year’s record of 64 species? We saw lots of birds at Deer Lake, but the Burnaby Lake team really made some standout finds, and pushed our respectable totals into higher territory. 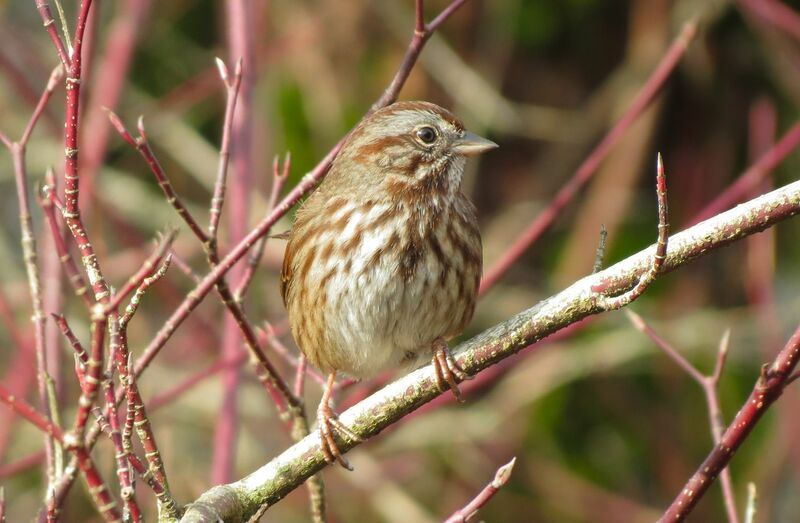 In both parks we did well with the Dickie birds (birder talk for small, bush-dwelling birds) such as Song Sparrows, and other species of smaller birds such as Varied Thrushes. However, at Burnaby Lake the team found 12 White-winged Crossbills, and a Townsend’s Warbler. Both birds are firsts for the Burnaby count, and the crossbills are the third record only for the whole Vancouver CBC, of which this count is a part – Area ‘G’. Considering that the Vancouver count has been running since the 1960’s, you can appreciate how rare an occurrence White-winged Crossbills are on a CBC. Unfortunately, I don’t have pictures to show, but see the links at the end of this post. The crossbills are part of an invasion of winter finches that is taking place across the continent this year. We counted record numbers of Common Redpolls (40), Red Crossbills (78), and an amazing 724 Pine Siskins, which is more than three times our previous high since the year 2000. 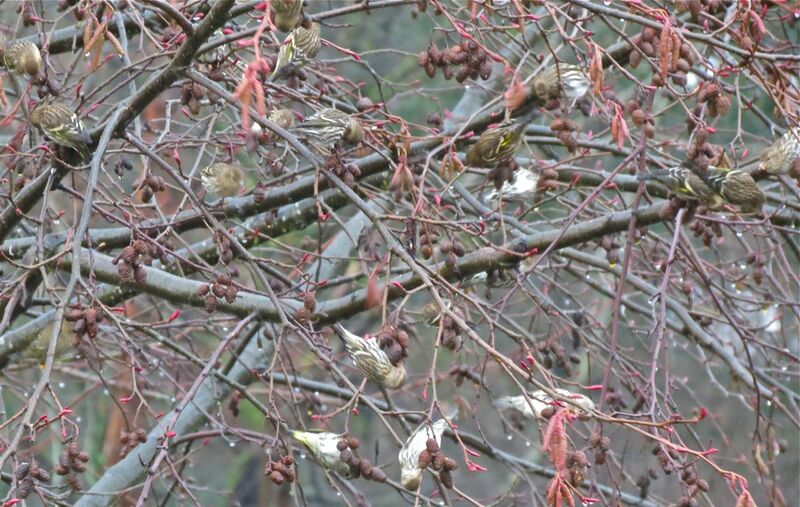 You may have noticed the swirling flocks of small, twittering finches, mostly staying high in the treetops when you’re out walking this year. You’re almost certainly seeing Pine Siskins. Here’s a very unsatisfactory picture of part of a flock of more than fifty birds. Very rarely wintering this far north, most Townsend’s Warblers head further south, many into Central America. As an insect-eating species, this individual, a spectacularly yellow male, has landed itself a tough winter trying to survive in Burnaby. However, they are amazingly tough birds, and it will likely survive if the winter is not too severe, gleaning hibernating insects from the conifers it likes to hang-out in. Northern finches heading south, southern warblers staying north, lakes unfrozen for the waterbirds, no rain or snow, and fields and bushes full of our resident and wintering birds, all these factors combined to give us a great result in this year’s Christmas Bird Count in Burnaby and Deer Lakes – a great seasonal gift. Oh yes, and the crow roost this year along the Still Creek corridor – about 8000 birds. And here for the Area ‘G’ Results 2012 species and numbers. Pictures in the above post were taken during the count, or in November and December this year, mostly in the Deer Lake area. Fraser Foreshore Park at the foot of Byrne Road, is a park I usually visit only a few times a year, most often in spring when migrant birds are moving through, and the trees and bushes are full of birdsong. But given my recent, interesting journey along the Still Creek corridor (See: Still Creek – Urban Wild, Birds and Poetry!) I thought I’d give another of Burnaby’s more “industrial” settings a look to see what I could see. With no high expectations for what I might encounter, I headed down on Friday morning ready for a long walk along the river, both west and then east from the parking area. 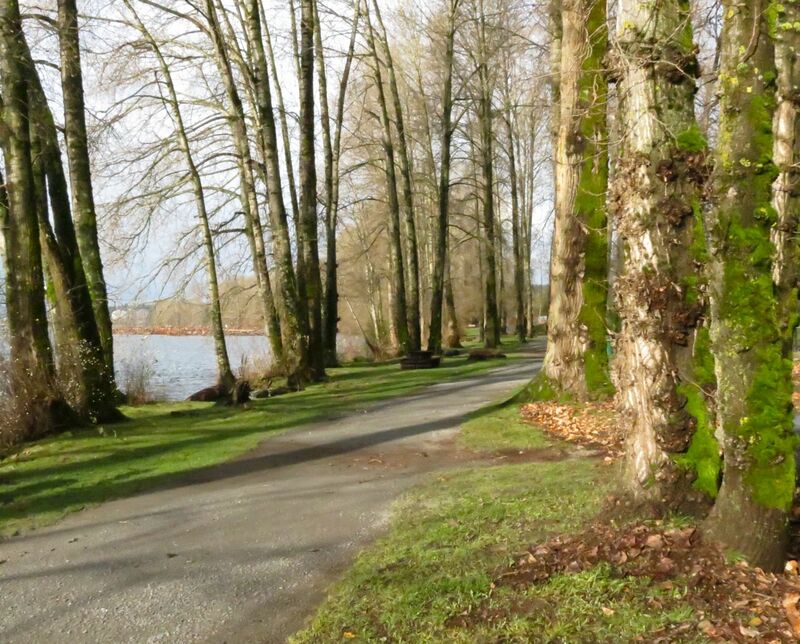 Much to my surprise, expectations were exceeded, and the long walk turned into a much shorter one, as I found much to see and enjoy just a short distance west of the parking area, and later walking north along Byrne Creek to the edge of the Riverway golf course, and back. The magnificent black cottonwoods along the river, pictured above, are one of the outstanding features of this park. Their leafless forms make intricate patterns of light and shade in the soft, winter sun. 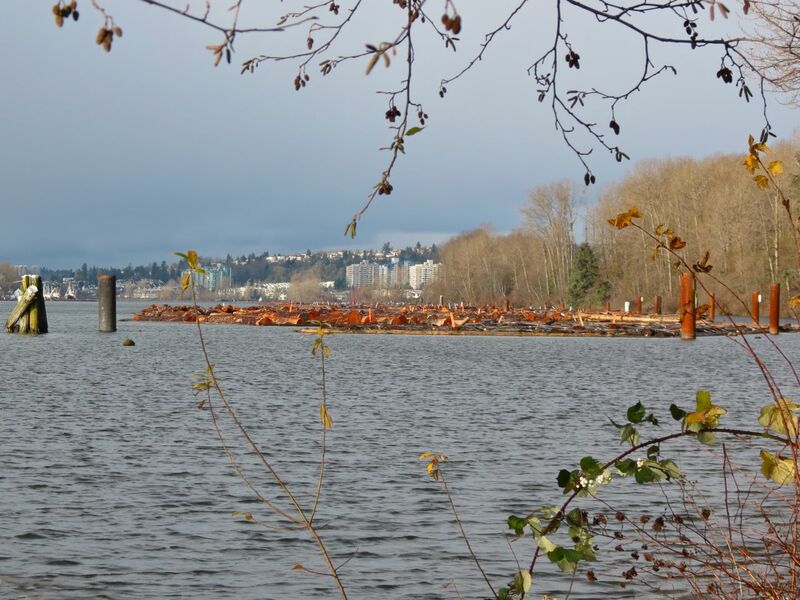 However, this is the North Arm of the Fraser, which is industrialized for much of its length as seen here by the huge log booms tight against the shore. And while we humans are busy being industrious along the river, that epitome of Canadian busyness is being extremely industrious too in the large pond, south of Glenlyon, that is just a short walk up the west side of Byrne Creek off the main trail along the Fraser River. Castor canadensis, the Canadian beaver (Canadian even in its scientific name! ), is causing a certain level of mayhem in the area. Perhaps it’s good to see that there’s more than a little bit of wild going on here amid the factories and traffic. But what’s good for me, is perhaps a bit of a nightmare for the good folks who are planting trees and trying to naturalize our industrial landscapes. Huge are trees felled. Here a willow. 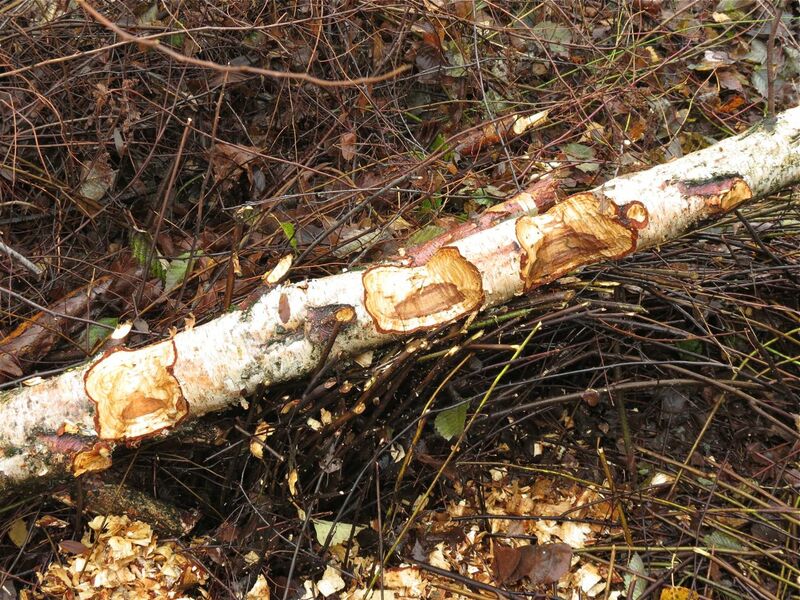 Paper birches are cut down in their prime – stakes, wire fencing, and strapping seemingly offering no barrier to a hungry beaver. And then the trunk is seriously gnawed, probably being cut into shorter lengths for dragging back toward the lodge. The drag lines the beavers use to tug their twiggy bounty back to the pond go right over the top of their lodge where, to the right, freshly-cut red alder branches lie in the water ready to eat. 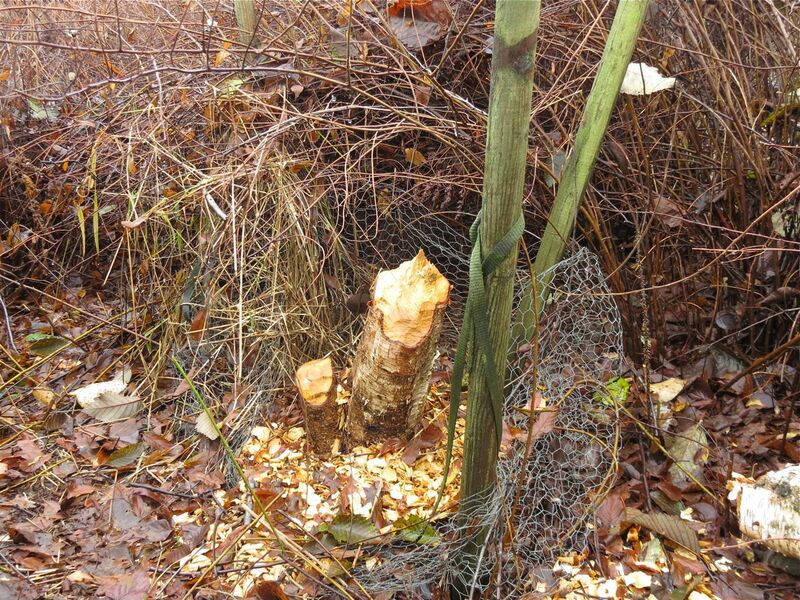 Beavers chew a lot of wood, but they don’t eat it, which explains the piles of wood chips they leave behind. They do cut through the wood to fall the trees, but they actually eat the bark and the nutritious cambium layer beneath it – their main foods for the winter months when other vegetable matter is in short supply. Large areas of bark and cambium are stripped off the large willow branches shown below. 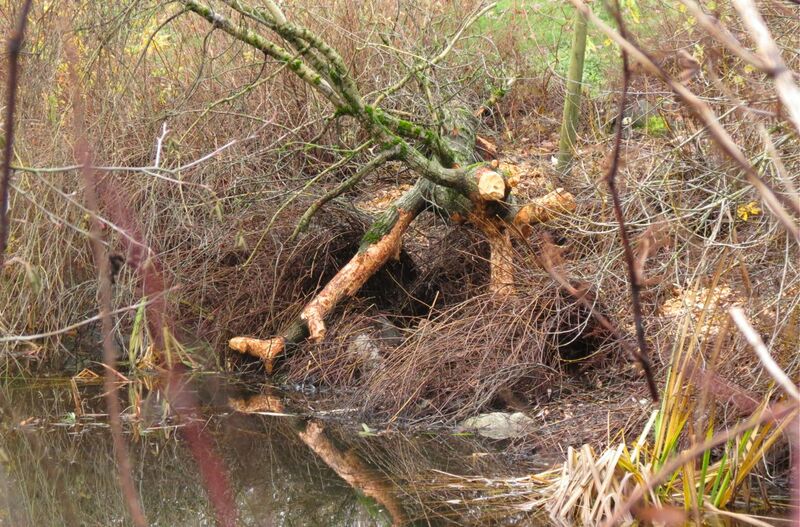 The beavers have been feasting on these large limbs. If the pieces are too big to drag back to the lodge, then it’s eaten it where it falls. The smaller stuff they neatly prune off to drag over to the lodge, and into the pond to eat. 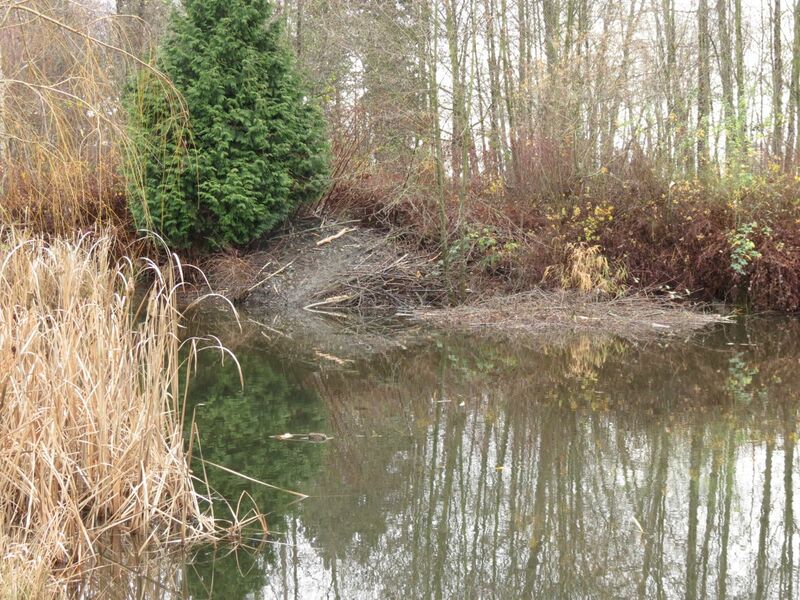 Of course the beavers are not the only wildlife using this pond. 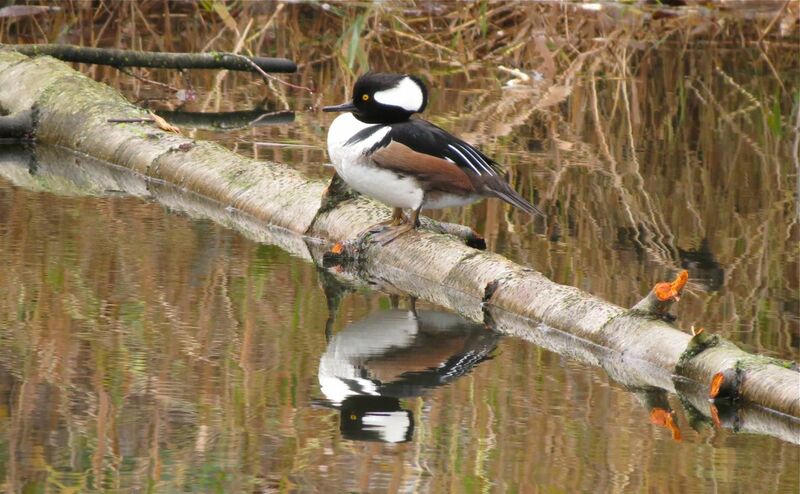 A pair of Hooded Mergansers were actively fishing while I was there. Here’s the male, hauled up out of the water on…? 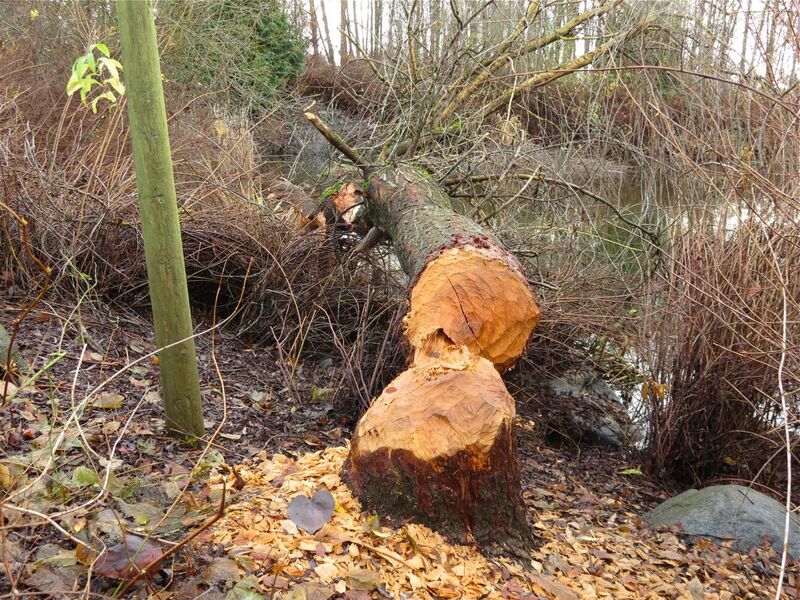 Right – a red alder log, newly felled by the local beavers, and trimmed of its branches. Possibly those same branches lined up outside the lodge in the earlier picture. For me, the “Hoodie” is one of the most beautiful ducks in North America – its spectacular crest gives it its name. In the picture above, it’s about half extended. When displaying to a female, or strutting its stuff in front of a competing male, the white crest extends in a beautiful arc right over the head. Remember to click on the picture to enlarge it. Take a look at the bill of the merganser above, and compare it to the female mallard below, and you’ll notice the huge contrast in the shape and size of the bills of the two birds. 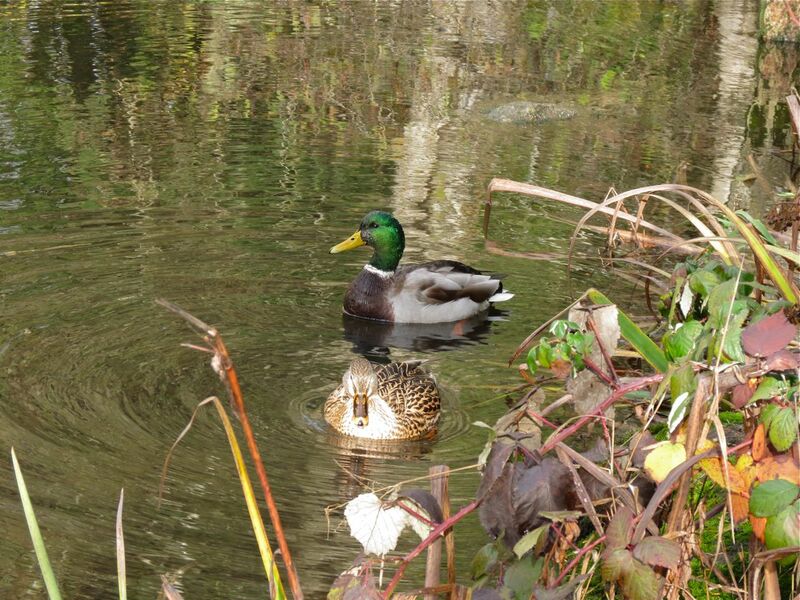 Both are ducks, but the Mallard has a typical duck-shaped bill, whereas the merganser’s is long and thin. And if you could see it close up, you’d notice it has serrated edges. Unlike the Mallard, a dabbling duck that eats mostly aquatic vegetation, the mergansers are divers that eat aquatic insects, fish, and crustaceans. The slender, serrated bill is used for grasping and manipulating their slippery, mobile prey. Not all the action was in the pond. The surrounding shrubby areas were busy with birds too, some of which were obviously regularly fed by visitors. 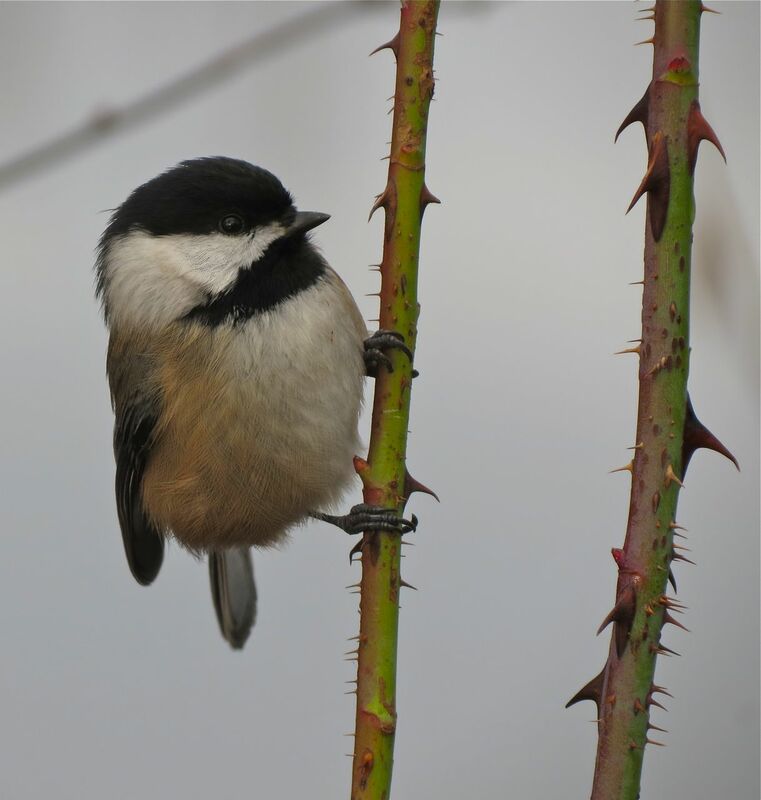 The Black-capped Chickadees were almost landing on me as I stood to watch them, but this offered the opportunity for some very close photographs. 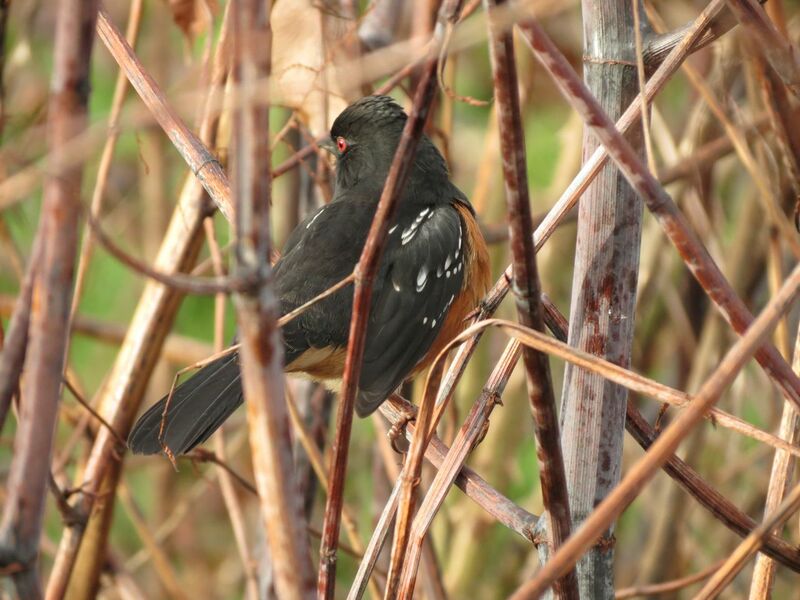 The Spotted Towhees were interested too, but stayed concealed for the most part. 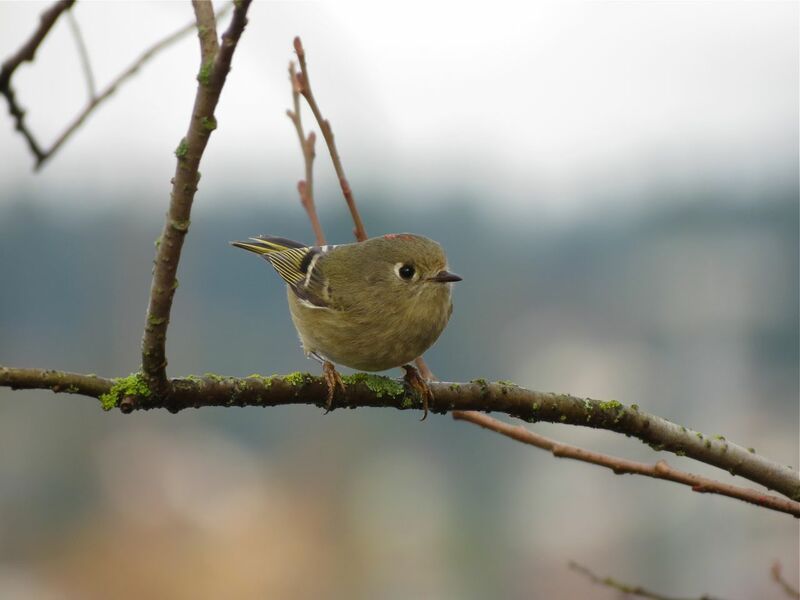 Another member of the mixed flock of birds here is the Ruby-crowned Kinglet, a hyper-active, wing-flicking midget of a bird (one of Canada’s smallest birds) that utters a buzzy ji-dit, ji-dit call as it scolds you from shrubbery. Listen to the call here. Ruby-crowned Kinglets are difficult to photograph because they are rarely still, and outside of the breeding season their ruby crown is usually hidden. On Friday, I was lucky enough to not only get a reasonably good picture of the bird, but also a glimpse of its ruby crown too. Click to enlarge. 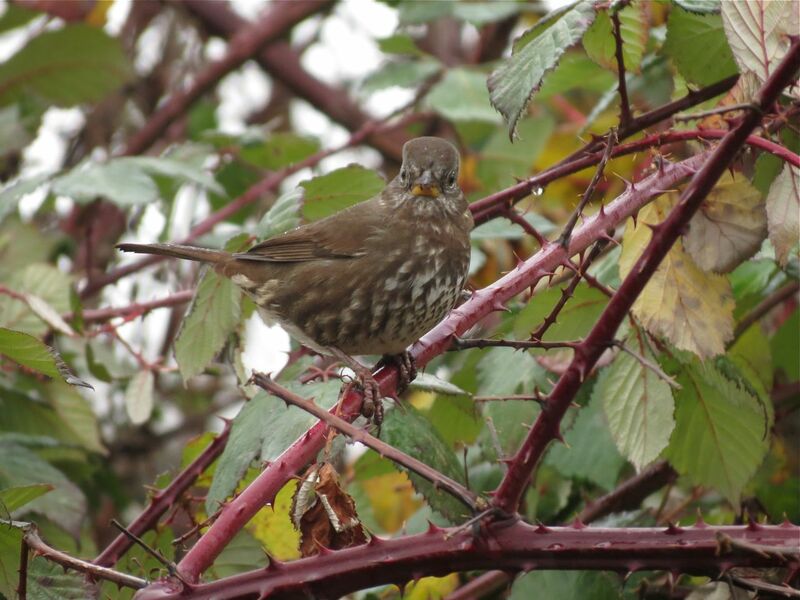 And the last photograph I managed on my walk was of this Fox Sparrow in a Himalayan blackberry bush. 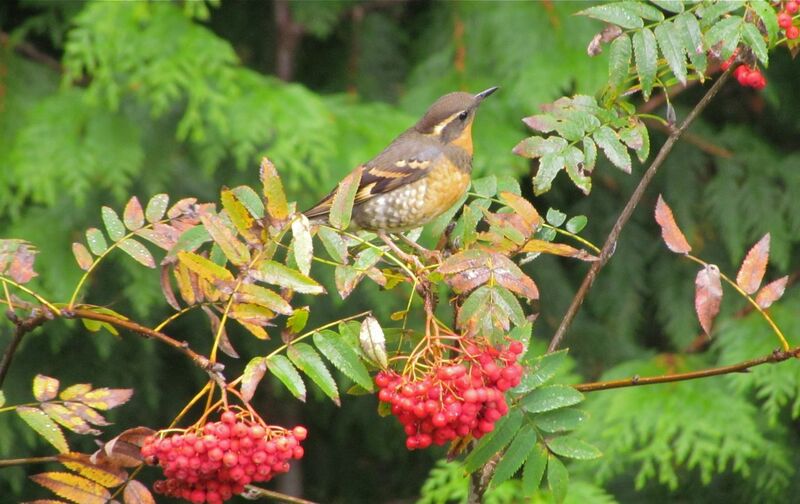 As I’ve noted elsewhere on this blog, here’s one of my favourites in one of our most important shrubs for wintering birds. While I did get a number of pictures of birds on Friday, I hoped to get a beaver picture to round off this post. 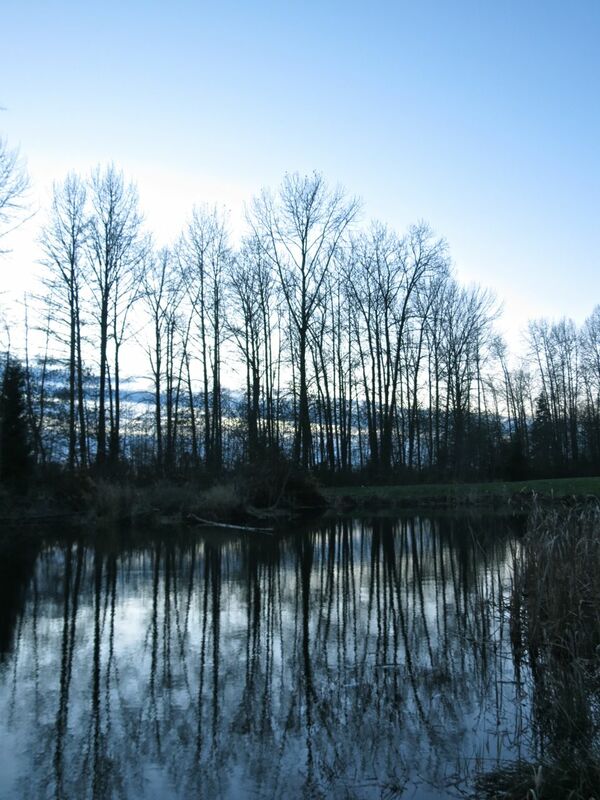 Mostly nocturnal, beavers often get active before nightfall, so I returned to the pond in the very late afternoon. Despite some patient waiting, I found no beavers out and about before nightfall, and had to be satisfied with a picture of the cottonwoods in the fading light reflected in the pond. Not a bad consolation at all. Buckingham Creek Bonanza – Again! An email from Deer Lake resident Leigh Palmer today, reporting salmon spawning again in Buckingham Creek, had me rushing down to the lake to view the action. 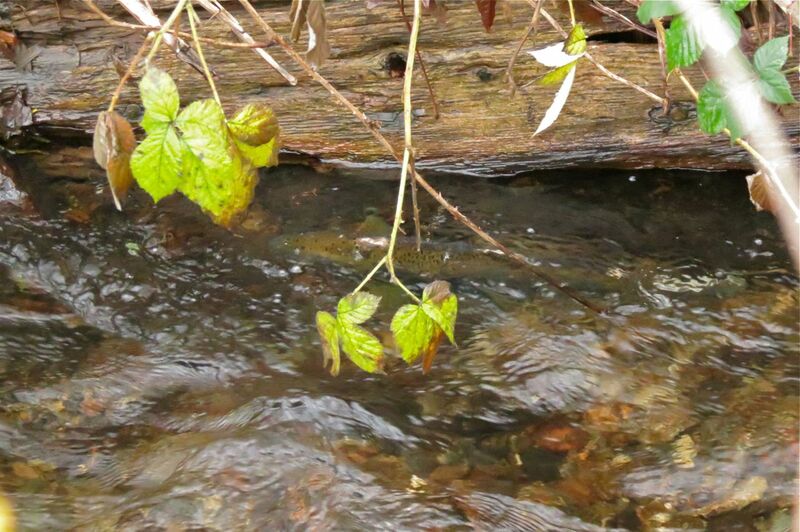 And sure enough, after the chum salmon arrival and spawning in the creek starting at the beginning of November, here we are at the beginning of December, and spawning coho salmon are now in the creek. 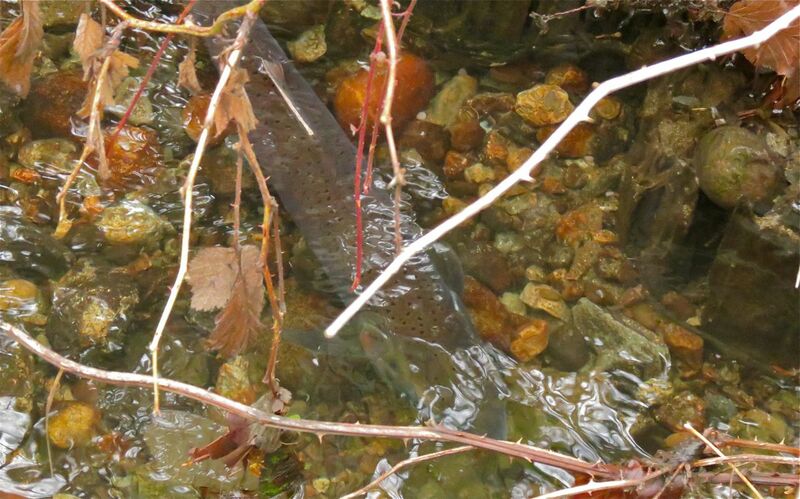 Tucked tightly under the bank, the fish were visible, but very hard to photograph given the dim light along the creek. Remember to click on the pictures for larger images. Some redd building action was visible from the viewpoint at the edge of the parking area, next to the playground swings, but there too photography was a challenge. However, our very good fortune was that Dr Palmer managed to make a beautiful video this weekend of the fish spawning. The spots along the back, and the bright red sides identify them as coho. Click here to view the action. The chum spawning here in November were much more subdued in their colouring (see earlier posts), and a few final decaying remains of that marvellous event are still visible along the creek. With the coho here now, our salmon viewing season at Deer Lake has just been doubled – a real bonanza at Buckingham Creek!